Hikone Castle is a magnificent 400 year old structure. It stands three stories tall, with an outer wall of stone at its base, and ivory white stucco above, a beautiful harmony that is characteristic of this castle. The castle grounds are encircled by what was once a triple moat, and remains today as a double moat. Hikone Castle is a structure befitting its value of 300,000 koku (an old system of measurement, in which one koku is equivalent to the amount of rice is takes to feed one person for one year). For a period of nearly 260 years from the reign of the castle’s first lord, Naomasa Ii, in 1601, to the 14th lord, Naonori Ii, in 1860, the castle was ruled by one family, during whose reign there were no assaults on the castle, nor any great changes made to the castle structure. In 1951, the castle was designated a historic site, and in 1956 a special historic site and cultural property. Despite being built in the early part of the modern period, Hikone Castle still retains features such as the defensive earthworks around the main bailey that are typical of mountaintop castles from the Middle Ages. Furthermore, as it was built with the aim of monitoring the power of the Toyotomi faction following the Battle of Sekigahara, in order to build it more quickly, it is said that buildings and stonework were taken from nearby Sawayama Castle, as well as from other older castles in the vicinity, such as Odani Castle, Nagahama Castle and Otsu Castle. Hikone Castle’s main tower (or tenshu) forms the castle keep, and was the center of the castle complex, and the town at large. Constructed nearly 400 years ago, today, Hikone is one of only twelve Japanese castles that still retains its original keep, and one of only five Japanese castle keeps designated as National Treasures. 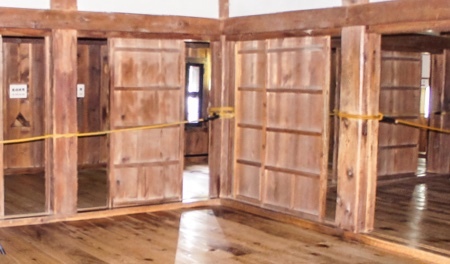 Despite the main tower’s graceful curved roofs, gilt, and elegant outward appearance, the inside was not so similarly furnished, as it was not meant to be occupied: the lords of Hikone castle lived in a villa just outside the castle. These gables form a gentle curve and have no bottom edge. Gables whose edges form the natural edge of the roof. Hikone Castle’s unusual number of these gables helps to make it appear larger when viewed from far away. 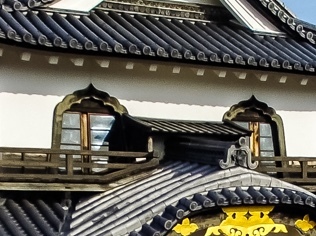 Kirizumahafu Gables also have no bottom edge, but are triangular in shape. 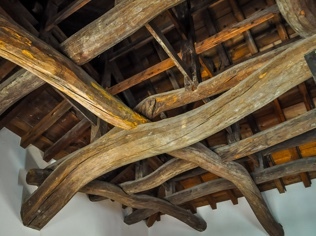 One of the features of the castle is that is uses nearly twice the number of longitudinal beams as there are transverse beams. They make quite a sight with their naturally curving pine wood. Invisible from the outside, a visit inside the keep reveals a wall cut with square and triangular holes. 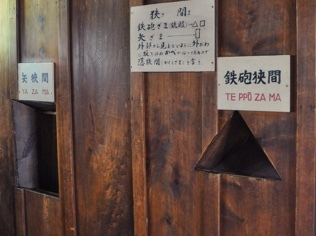 Triangular holes, or teppozama, were embrasures for guns, and used to fire upon an approaching enemy. Yazama, their square counterparts, were embrasures for arrows. Both are camoflaged from the outside to look like an ordinary plaster wall. Hikone Castle’s main keep has a total of 75 embrasures. The stairs within the keep are very steep, but the windows from the castle’s top story provide a beautiful view of Lake Biwa. Katomado are beautiful bell-shaped windows, their tops pointed like the tips of flower petals. “Kato-mado” can also be written using different characters that mean “firelight windows,” referring to their flame-like shape. These windows were characteristic of zen temples built during the Middle Ages. Though they were originally only featured in such temples, the influence of Kato-mado can be seen in the architecture of other buildings as well. Hidden from view (and not open to the public) within the keep are several tiny hidden rooms, covered with very low sliding doors and able to fit about 4-5 people. 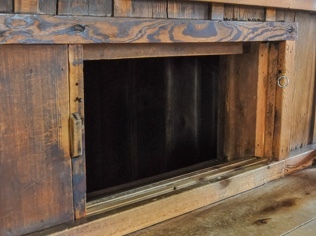 Almost no more than a crawl space, the secret rooms are comprised of the space naturally left behind the castle gables. The hidden rooms are largely shrouded in mystery, but would surely have provided a good hiding space for the lord in times of attack. The three-storied main tower is built on a foundation that uses “uchikomi (driven) hagizumi” stonework. 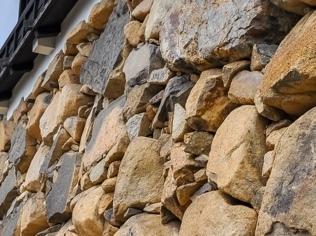 This style fits together large and long uncut stones, and locks them together with smaller stones. 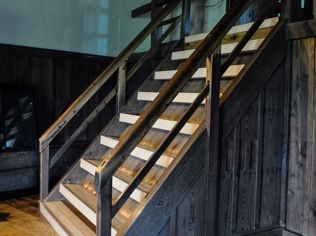 The uchikomi hagizumi style’s relative flexibility made it able to withstand earthquakes well. 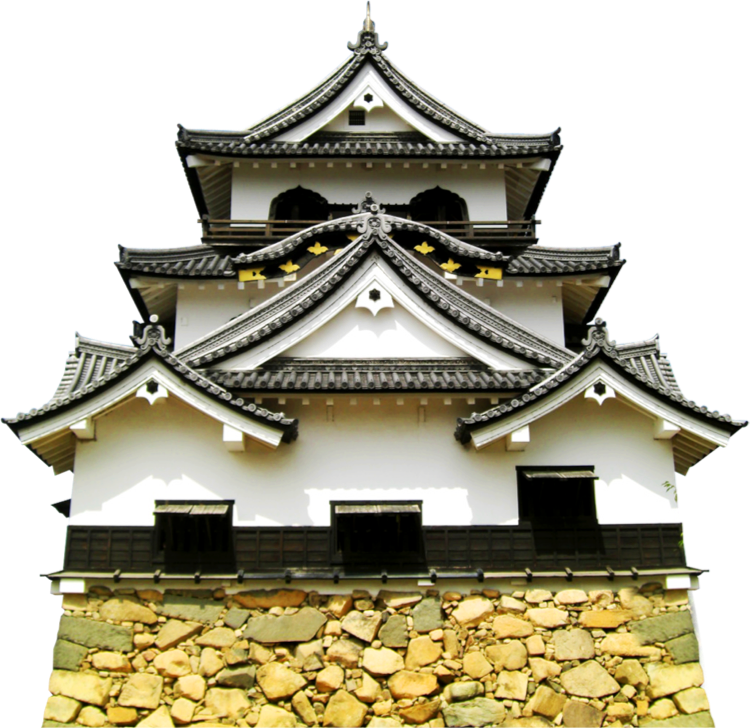 Most of Hikone Castle’s is constructed with different styles of stonework.